Today, the weather has been atrocious. I spent the 30 minutes walking home from work getting drenched – it was too windy for me to put my umbrella up – and I got home feeling miserable and cold. I soon cheered up, because I remembered this was on the menu tonight! 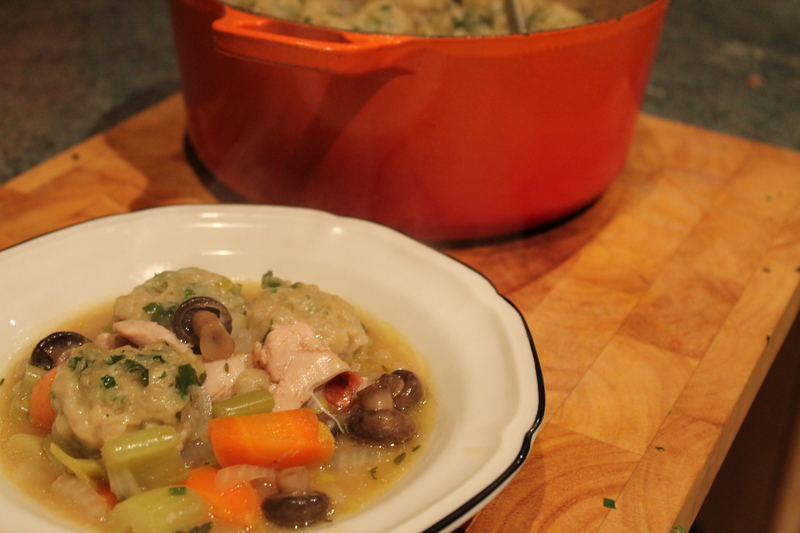 Mmm, a nourishing chicken casserole packed full of veg, as good for the soul as a classic chicken soup, and topped with soft, pillowy dumplings. What’s not to like! As has been the case with the rest of my recipes this week, this is sort of healthy – in that it is healthier than a beef stew with dumplings, and if you really wanted to, you could leave off the dumplings and just eat a gorgeous chicken casserole. I don’t understand why anyone would do this though, the dumplings are the best part. This is part 4 of my Cheap Eats project, I hope you’re enjoying it! This recipe will serve at least 4 and takes approximately 1 hour to make. 1. Chop the chicken into bitesize pieces. Heat the oil in a large casserole dish and add the chicken. Brown briefly (don’t cook all the way through), then remove from the pan. 2. Tip the chopped onion, carrot, celery and fennel to the pan. Cook for 5 minutes, stirring often, then return the chicken to the pan. Stir in the flour, then pour in the stock. Add the bay leaves, thyme and mushrooms, season, and bring to the boil. 3. Put a lid on the dish and pop in the oven at 180 degrees for 20 minutes. 4. 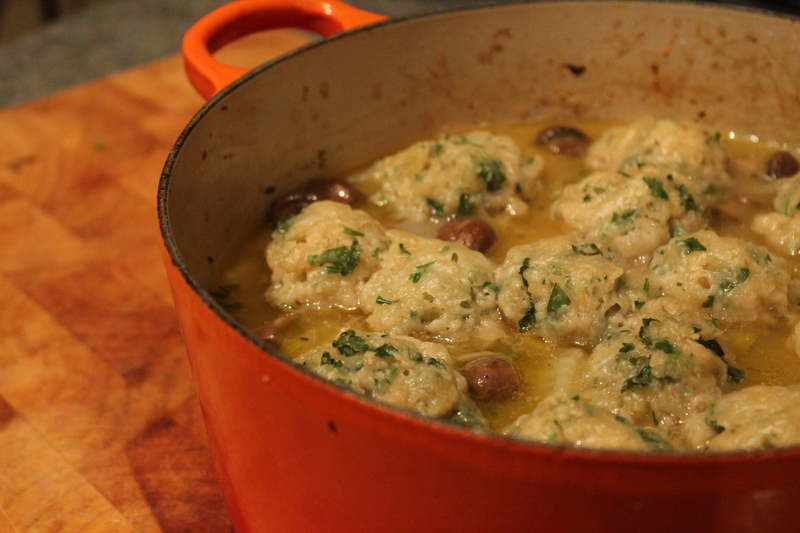 For the dumpings, tip the self-raising flour, suet and parsley into a bowl. Season with salt and pepper. Add cold water a little at a time – you’ll probably need 150-200mls total – until it forms a pliable dough. 5. When the casserole has been in the oven for 20 minutes, take it out (leave the oven on). Form little balls (about 1.5 inches in diameter) with the dough and place evenly spaced on top of the casserole. This mixture made 14 dumplings. 6. Put the lid back on and return to the oven for another 25 minutes. Yum! Omgosh! yes! I love this dish, this looks so yummy and perfect in the winter! Sounds delcious, I have never made dumplings but might well have to try after seeing your parsley ones, they look and sound perfect for the January weather. This looks delicious! I’m excited to follow your blog. You already have so many yummy recipes! Terry, thank goodness you had these on the menu – our high today in South Carolina is 37 – so sounds like a yummy meal for these cold nights!! Thanks! Oh they’re great aren’t they? I use my le creuset for everything! Yes so great! Will be using mine tonight for some fresh mahi mahi! include apƿroximately аll imρortant infos. I’d like to see more posts likle this .